Focus Hearing was developed to offer hearing aid users of Australia a real choice when purchasing their next set of hearing aids. If you have already been quoted for new hearing aids, take a look at our indicative price list and see for yourself (click here to view our price lists). If you would like a competitive quote on your next set of hearing aids either call us directly or send us an enquiry and we will call you back with a quote within 24 hours. At Focus Hearing we offer telephone or online consultations (via Skype) at a time which is convenient to you. No need to wait weeks for an appointment to simply discuss your options. Click on our Consultation page to see how Focus Hearing’s online services can help you. If you have had a hearing test performed recently, simply head to our ‘Contact Us’ page and upload your hearing test so our audiologist can review the results and recommend or confirm whether a particular hearing aid is suited to your results and your listening needs. We will happily offer a 2nd opinion or a comparison quote. In addition, where possible we openly publish indicative hearing aid prices so you can conveniently ensure you are getting the best possible deal on your next set of hearing aids. You can also research the hearing aid features by simply hovering over the feature to view its description and advantages. If the hearing aid you are after is not listed simply call or email us and we will supply you with a quote. With improvements in hearing aid technology, some hearing aids have the ability to be remotely programmed. Which means if you are unable to get to one of our sites for an adjustment we can arrange an online adjustment of your hearing aids. This feature is currently available with the Starkey range of hearing aids, and we believe that it is only a matter of time before other manufacturers adopt this technology. Note this does not take the place of the comprehensive initial fitting appointment. 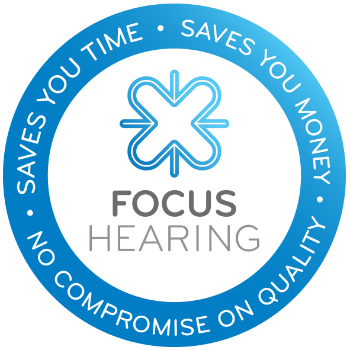 At Focus Hearing you are not required to pay for your hearing aid until the completion of the fitting appointment. You then have the peace of mind of our 30day money back guarantee. All our hearing aids come with the full manufacturers warranty which is typically 3 years from the fitting date.